I know that many have asked that question before, but I have seen no one ask it for Ubuntu 14.04. I have a test installation of Ubuntu 14.04 with GNOME 3.10 and I have also installed the Flashback sessions. Using either Unity or the Flashback Sessions, (Compiz and Metacity), I can change the change-layout combination to Alt+Shift and it works. If I go to: System Settings-->Keyboard-->Shortcuts-->Typing-->Switch to next source, I can set it to Super+Space but NOT to Alt+Shift. If I go to: System Settings-->Keyboard-->Text Entry, I can set it to Alt+Shift L.
Now the first time I logged in to the GNOME Shell, the combination worked, but after a while it stopped. I tried every setting available through the GUIs but none of them worked properly. Right now I am in a state where the combination works everywhere but the GNOME-Shell. If, working with GNOME-Shell, I go to: System Settings-->Keyboard-->Shortcuts-->Typing-->Switch to next source, I can set it to Super+Space but NOT to Alt+Shift. Also even if I set to Super+Space it does not work. I have also tried to change it through GNOME-Tweak Tool but what it does it is that it actually changes the "Modifiers-only Switch to next Source" found in the above mentioned Keyboard settings, but it still does not do the trick. In the GNOME-Shell the combination works only to change the layout from EN to GR. In order to change from GR to EN I have to use the mouse and go through the indicator on the top bar. Which by the way does not follow the current layout anyway. Having faced this problem in Ubuntu 13.10 with GNOME I hoped that it would be fixed in 14.04. I have set up the system but made no modifications to it whatsoever through command line. I have only used GUI menus, and the only modifications I tried where the ones described above, regarding the change-layout key combination. Click on it and choose "Alt+Shift"
This is on GNOME 3.18. 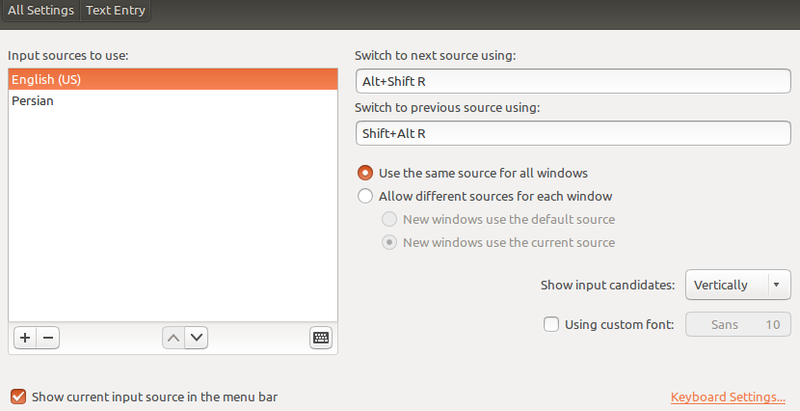 To change the shortcut to ALT+SHIFT on Ubuntu 14.04 you must click on language on the bar, and select "text entry settings", and tap on "Switch to previous source using:" or "Switch to next source using:" input and click on "Shift" + "ALT", that's all. I was experiencing some problems with switching the layout and this is how I solved it. Open dconf editor and navigate to desktop->ibus->general->hotkeys and change the values for next-engine and next-engine-in-menu from ['Shift_L+Alt'] to . Then open Tweak Tool and in the Typing section set the Switching to another layout to alt+shift. Everything solved that way. 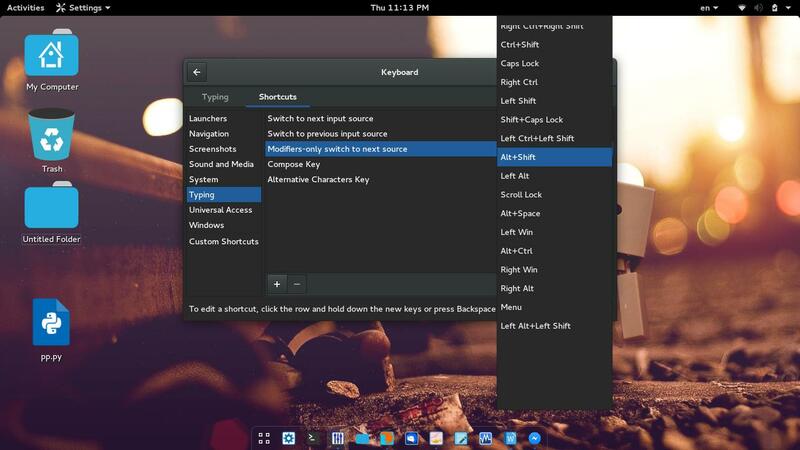 Tweak tool is already installed in GNOME 14.04 so just search for it!!!! In Ubuntu 17.10, GNOME 3.26.2.1, i got it to work using the GNOME Tweak Tool. System settings / Keyboard / Layout settings / Options... / Key(s) to change layout. if you want set a layout like windows os. Not the answer you're looking for? Browse other questions tagged gnome keyboard-layout or ask your own question. Ubuntu 17.04 - how to set Alt+Shift as keyboard layout switch?